Oceanus was one of the major water gods of Greek mythology. Oceanus was a powerful god of the Greek pantheon, and from him, ultimately, all of the world’s freshwater was said to arise. Oceanus came from the generation preceding that of Zeus, for Oceanus was a Titan god, the son of Ouranos (Sky) and Gaia (Earth). Oceanus was considered to be the first born of the 12 Titan gods, but was quickly followed by 5 more male Titans and 6 Titanides. The rise in importance of Oceanus comes about because of the downfall of his father Ouranos. Oceanus’ mother, Gaia, started plotting to overthrow Ouranos, for Gaia was upset about the imprisonment of her children, the Cyclopes and Hecatonchires, within Tartarus. Eventually, Cronus was convinced to wield an adamantine sickle against his father, and so when Ouranos next descended from the heavens to mate with Gaia, Cronus castrated him, whilst the other Titans held their father down. Now it was generally considered that Oceanus did not hold Cronus down, for Oceanus was not named as one of the Pillars of Earth, unlike the other four brothers, Crius, Coeus, Iapetus and Hyperion. Cronus would take up the mantle of new supreme deity of the Greek pantheon, and Oceanus would be given dominion over the world’s waters. 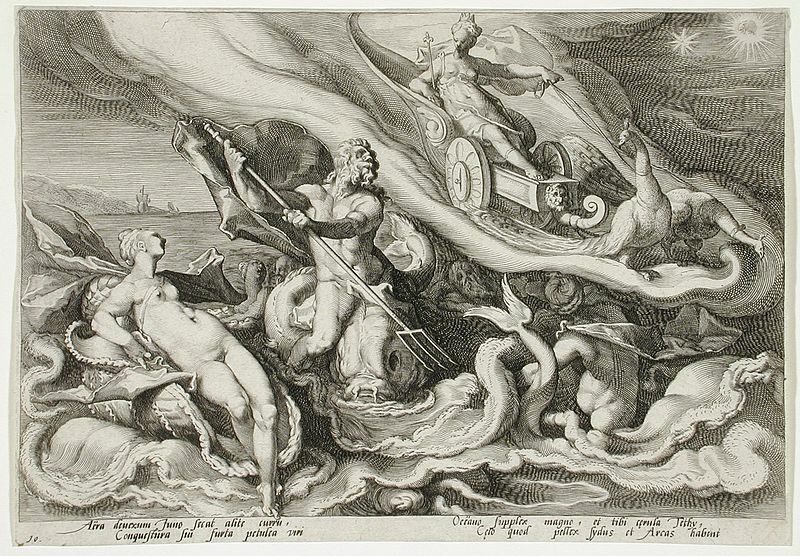 There were of course already water-gods before Oceanus, most notably Pontus, the Protogenoi god of the sea. Pontus was equated with the Sea though, whilst Oceanus was thought to have dominion over the earth encircling river that was believed to lie beyond the Pillars of Heracles. Thus originally, Oceanus was a freshwater god, and the ultimate source of all freshwater found on earth. Oceanus would reside in a magnificent palace beneath the surface of his domain, as would his wife, the female Titan Tethys. It was only in later antiquity that it was discovered that the waters beyond the Pillars of Heracles were not freshwater, but salty, just like the waters of the Mediterranean, and then Oceanus started to become interlinked with Pontus. In order to explain the presence of freshwater across the known landmasses it was said that each source of freshwater was a child of Oceanus; and as such, Oceanus became, by Tethys, father to 3000 sons and 3000 daughters. The sons of Oceanus were the Potamoi, the Greek river gods, whilst the daughters of Oceanus were the Oceanids, the freshwater nymphs of lakes, pools, ponds, springs and rainclouds. Of course, not all of the 6000 children of Oceanus were named in ancient sources, but time and time again, one of the offspring of Oceanus would appear in mythological tales. Potamoi would often appears as opponents for heroes, for famously Achilles would fight against Scamander during the Trojan War, whilst Achelous would wrestle Heracles for the hand of Deianira. Many of the Oceanids would also appear as lovers of other gods, and Doris, became the wife of Nereus. Zeus also had many Oceanid lovers, including Metis, Eurynome and Pluto. Just as Oceanus had not taken part in the overthrow of Ouranos, it was also said that Oceanus did not take part during the Titanomachy, the War of the Titans, where his brothers fought against Zeus and his allies. Some also tell of how Oceanus advised his daughter Styx, that she should side with Zeus during the war, and as a result Styx was famously the first to ally with the cause of Zeus. During the fighting, Hera, and possibly Demeter and Hestia too, were placed in the care of Oceanus, living there until the fighting ended. Thus Hera was said to regarded Oceanus and Tethys as parental figures. Some also tell of how the female Titans also stayed there in safety for the ten years of the war. With the victory of Zeus at the end of the Titanomachy the cosmos was then re-divided amongst Zeus, Hades and Poseidon; with Poseidon given dominion over the earth’s water. As Oceanus had not gone against the will of Zeus though, Oceanus was left to rule his own kingdom beyond the Pillars of Heracles, whilst Poseidon became the ruler of the Mediterranean, although the Potamoi and Oceanids were considered subservient to the Olympian god. Despite being a Greek water god, Oceanus was closely associated with the celestial bodies, for the processions across the sky, in their associated chariots, of Helios (Sun), Eos (Dawn) and Selene (Moon), would all end in the realm of Oceanus. Then the gods would travel, either on the surface of Oceanus, or beneath the surface of the river, to get back to their starting point, so their procession could commence again the next day. Also many of the constellations would also dip into the realm of Oceanus, but famously, Hera would ask that the constellation Callisto (Ursa Major), be forbidden to drink or bathe in the waters of Oceanus, so in antiquity, no part of the constellation dipped below the horizon. Oceanus appears but seldomly in surviving mythological tales. Oceanus though, does appear in one of the adventure of Heracles, for when Heracles is travelling to the island of the Hesperides, Heracles threatens the god, until Oceanus calms the waves which were threatening to overwhelm Heracles’ vessel.